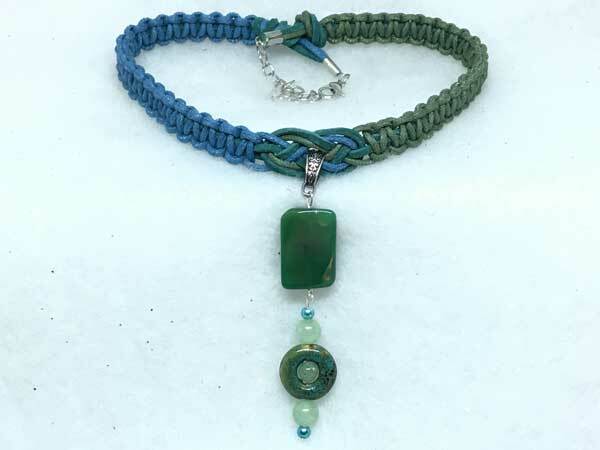 This piece is made with the beautiful richness of suede cord and waxed cord in sage green, medium blue, and teal. The length can vary from about 16 1/2 to 19 1/2 inches with a center jeweled piece that adds over 3.25 inches. The jeweled piece begins with a beautiful, twisted teal glass rectangle. Hanging separately from this, for added movement and sparkle, is a piece that contains 2 large and 1 small adventurine rounds. The smaller one sits in the center of a lovely ceramic donut done in blue, green and specs of brown. Surrounding all of this are 2 small blue pearl rounds.